Andrew Hughes is a target for Championship club Preston. Peterborough United have rejected three bids from Preston North End for left-back Andrew Hughes. But Posh director of football Barry Fry, the man in charge of transfer negotiations at the ABAX Stadium, expects the Championship club to come back with a higher offer for the rock-solid 26 year-old, one that could take Hughes to Deepdale. 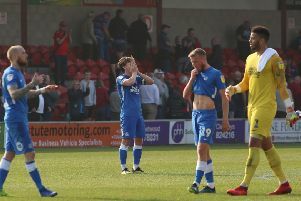 Lewis Freestone could force his way into Posh's first-team plans. Hughes is entering the last year of his current Posh contract and is unlikely to sign an extension according to Fry. “We’ve turned down three offers from Preston so far, but if they up their offer slightly the deal could well be on,” Fry said this morning (June 20). “Andrew is 26. He has only played for us and Newport and he fancies the challenge of the Championship and the benefits that come from that. “I expect Preston to come back for him. “We have signed a left back in Colin Daniel this summer and we are pursuing another player who can play in multiple positions including left-back. Posh signed Hughes on a free transfer from Newport two years ago. He’s been a dependable defender making 102 appearances and scoring four goals.